Like many others, I am a huge fan of Audrey Hepburn. I love the classic and timeless looks she offers, especially in Breakfast at Tiffany’s. I have some of the clear acrylic organizers but I am just so bored with them. Plus, most of them are so bulky and I like using as much vertical space as possible. 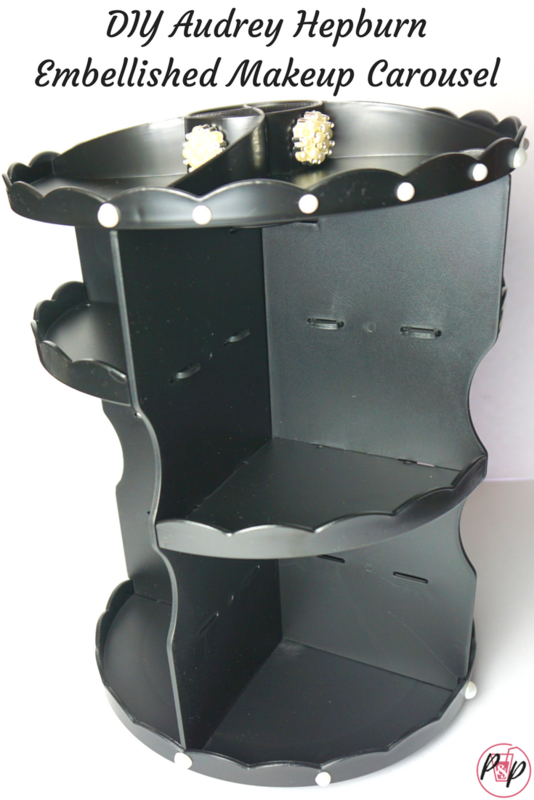 I was stoked to find a tall carousel style makeup organizer on Amazon. Even better, they offer this style in black, which doesn’t show makeup stains as easy as clear or white. I still wanted something a little less plain and the scallop shapes were just begging for embellishment. Plus, I am all about the easy crafts and this craft is so easy a kid could do it! I linked to the supplies I used below but feel free to be creative and glam up your own organizers. I didn’t have luck finding the flat pearls at any of my local craft stores but you may be able to. 2 Packs of Flat adhesive pearls – note: you can get away with one pack if you don’t want as many pearls. Put the carousel together: My package did not come with instructions but there are instructions on the item page. 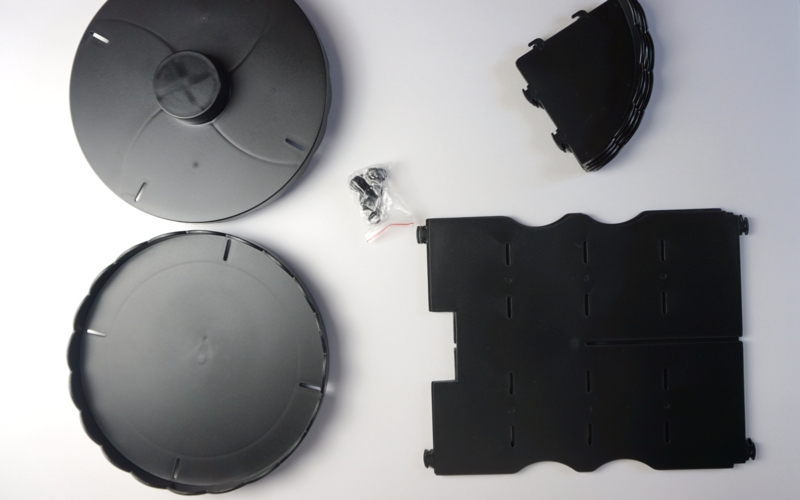 Luckily it was pretty obvious to put together – the part that acts as the lazy Susan goes on the bottom (the bottom left item in the image above). The big flat pieces (bottom right in image above) slide into the slots. The top piece sits on top, just make sure the scallops on the top piece are pointing to the ceiling (top left item in image above, but flip over). Insert the trays (top right items in image above) in the slots based on how tall your items are. Secure the trays with the included rubber bands (shown in baggies in the middle of image above). 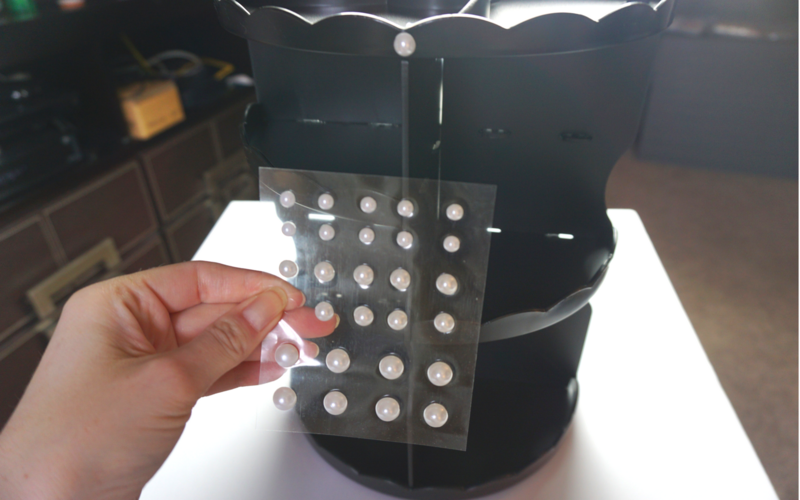 Secure rhinestones: Use a hot glue gun to secure the large rhinestone pearls to each section of the top. Hold the rhinestone on for a few moments to make sure it will stay in place. 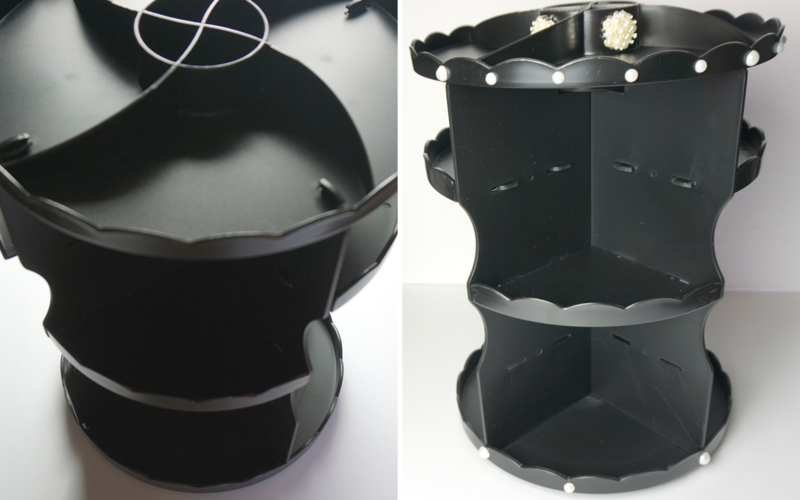 Place adhesive pearls: I placed the smallest size adhesive between each scallop at the top of the carousel and medium ones at every fourth of the way at the top. At the bottom, I used the largest size pearl flats. I didn’t add many to the bottom but I may add more later. If you want the bottom to be even, place the pearl flat every fourth of the way and two and a half scallops in between (whoops – I accidentally did two and then realized it should have been 2 & 1/2! ).